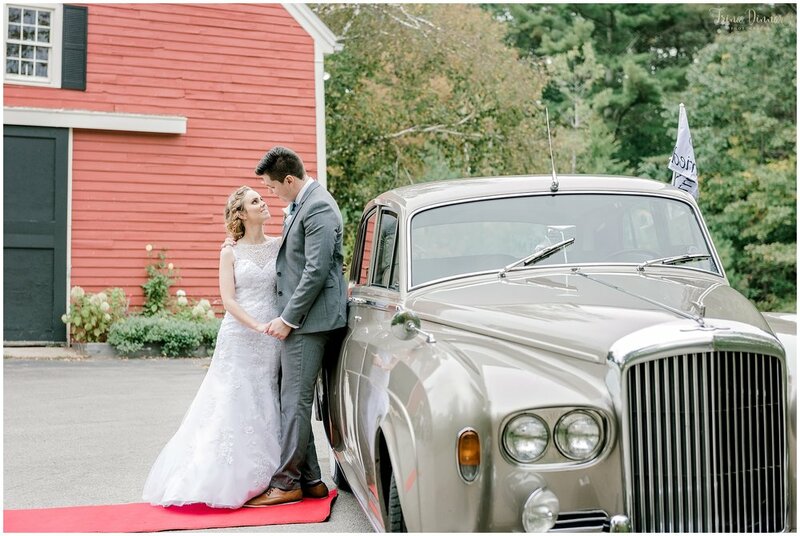 Mallori and James were married on October 7th, 2018 at Clay Hill Farm in Cape Neddick, Maine. I was very excited to be returning to Clay Hill Farm after second shooting there this spring. I have a lot of great memories working one of my first jobs there as a teenager setting tables. Clay Hill Farm has since renovated and there’s a lovely bridal suite upstairs, where Mallori got ready. There was light rain falling as Mallori and James did their first look upstairs on the balcony. Luckily, the rain was short-lived and cleared up right in time for the couple’s lovely outdoor ceremony. The property has a lovely walkway and gazebo location that’s perfect for wedding ceremonies. While guests enjoyed cocktail hour, we took photos outside with the gorgeous Maine foliage as a stunning backdrop. Once everyone was inside and seated in the dining room, Mallori and James were announced into their wedding reception and shared a beautiful first dance together on the dance floor. Clay Hill Farm served up the delicious food and then Mallori had a dance with her dad and James had a dance with his mom. The rest of the reception was a lot of fun. There was dancing inside and games outside. I particularly loved Mallori and James’ last dance to the lesser known Symphony version of “Perfect,” sung by Ed Sheeran and Andrea Bocelli. As the wedding came to an end, everyone gathered outside for a group photo in front of the venue. They also did an adorable exit where family and friends tossed seeds as they walked through the crowd. Lastly, Mallori and James waved goodbye to family and friends as they drove away in an adorable antique car. All in all, it was a perfect day and I’m so glad Mallori and James chose me to capture this special day. I was so excited when Lindsey reached out to me last year about photographing her and Evan’s wedding. Her and her family were so nice and I knew right when I met them that the wedding was going to be wonderful! Lindsey and Evan’s wedding ceremony took place on October 6th, 2018 at St. Maximilian Kolbe Parish in Scarborough, Maine. They had a lovely full mass Catholic ceremony with Rev. Innocent Okozi. Following their ceremony, everyone drove up the street to the wedding reception at Camp Ketcha. We were lucky enough to find some colorful foliage on the property for portraits, as much of the landscape was green. It was certainly worth walking around to find the best locations though. After enjoying a lovely dinner, Lindsey shared a dance with her dad. I loved that he had sung the song to her as a baby and had known that someday they’d be dancing to it at her wedding. Near the end of the song, he lifted her up and danced across the dance floor, still with his little girl in his arms. Truly heart-warming! Equally as emotional was Evan’s dance with his mom. There were tears as they danced and he told everyone after the song that his mom had a bout with cancer. There wasn’t a dry eye in the room. Lindsey and Evan cut their wedding cake and danced the night away with their family and friends. As the the reception came to an end, the couple had a special sparkler exit before departing for the night. All in all, it was a beautiful day celebrating Lindsey and Evan’s love. I’m so grateful they chose me to capture these special memories for them. When and where did you get engaged? Tell us about the proposal. In Evan’s words: “She thought I was being super sweet, asking her for a night out to dinner with her parents, little did she know I had a plan in place. I texted her dad on the way down, told him I had an important question that Lindsey COULD NOT find out about. This was the most nervous I had ever been to ask someone something, and I make cold calls on a regular basis at my job. I asked her dad if I could marry his daughter, he was glad I asked him and gave me his permission. It was a good thing, because I had just dropped my savings on a ring for her just days before. I had a great plan in place that my coworker Mark had helped me on. She loves horses so I knew taking her on a carriage ride would be incredible. Tell us about your wedding dress and any other details you'd like to share. In August 2011 I was entering my first year of college at UMaine in Orono. I decided to join the UMaine marching band and it was our very first marching band rehearsal that I met Mike. He was entering his junior year of college. I didn't know anyone in the marching band would always be alone when we walked around campus to get to our next rehearsal. Mike noticed this and started walking with me. We started to get to know each other during these long walks across campus. On September 5th Mike asked me if I wanted to go for a nature walk in Bangor and I agreed. We couldn't find the entrance to this nature trail and ended up walking through the woods. We walked for miles and had no idea where we were. Luckily we found a lady who was doing some work or her field and asked her where the trail was. She pointed us in the right direction and we eventually found the trail. When we headed back we realized we just needed to park about a couple hundred feet ahead to the trail head. When we got back to campus Mike asked me if I had fun. I said yes. He asked me if I wanted to do more stuff like this. I said yes. He said do you want to go out? And you guessed it, I said yes. A couple years later Mike and I hiked Mount Washington for the first time with some of my family. We both loved it so much that we wanted to continue hiking, but not just in the White Mountains. Mount Washington is the tallest mountain in New Hampshire, Mike said to me one night if I wanted to hike all the state's highest points. I said yes. After I graduated college in 2016 we set off for a 3 week vacation out west to hike some of the mountains out there. I was most excited for Colorado. Mount Elbert, Colorado's highest peak is over 14,000 feet tall and is still to this day the tallest mountain we've ever hiked. Mike and I were slow to hike it but we made it and as we sat on the top of the mountain huffing and puffing, trying to catch our breath Mike ask me if I remembered how he asked me out. I said yes. He said do you want to do more stuff like this. I said yes. He said do you want to marry me? You guessed it, I said yes. He had carried the ring to the top of the mountain and put it on my finger. For our honeymoon we are heading out to Hawaii to Hike Hawaii's tallest mountain, Mauna Kea. All ll I knew I wanted for the wedding is that I wanted it to be in September and I wanted it to be Fall. September 29th was the perfect day. I also knew our colors had to be burgundy and navy blue because they look so well together just like Mike and I look so well together. Our party favors were coasters made from pieces of cedar wood that my father cut down from my home in Maine. We bought a branding iron that had our names and the date of our wedding and a nice flowery design. We burned the brand in to the wood pieces and put many coats of polyurethane on them to make them shine and put a piece of felt on the back side. I was so excited when Lisa and Bill contacted me last year about photographing their wedding at Village by the Sea in Wells, Maine. Not only is Village by the Sea a beautiful coastal wedding venue, it also happens to be the place that I got married 7 years ago. Needless to say, the location holds a special place in my heart. September 15th, 2018 was Lisa and Bill’s big day! I arrived early enough to photograph all of the breathtaking details that made this wedding even more wonderful. From the stunning bouquet to the elegant ballroom and all its décor, photographing this wedding was truly a photographer’s dream. Colors of teal and peach coordinated perfectly with the romantic beach setting. Lisa and Bill had their first look outside in the garden and we were even able to take all of the family and wedding party portraits before the guests even arrived! The couple had a lovely outdoor wedding ceremony under the venue’s pergola. After that, everyone enjoyed cocktail hour out on the patio. The wedding party was announced into the reception where Lisa and Bill followed the entrance with their first dance. After Lisa had a dance with her father and Bill had a dance with his mother, the maid of honor and best man said a few words and gave a nice toast to the couple. The rest of the reception was full of great moments: delicious food, the cake cutting, and lots of dancing and laughs. It truly was an evening to remember. I was especially touched by Lisa and Bill’s love story. The couple had dated in 1985 and ended up going their separate ways only to find each other again a couple of years ago. The spark was rekindled and they realized that they were meant to be together. And so the saying goes that if you let someone go, they will come back if that’s your destiny. After photographing Lindsey and Chris’ engagement session this past winter, I was very excited when their wedding day finally came! August 18th, 2018 was the perfect day for a wedding, even with the stormy weather forecast, the rain held off the entire day. Lindsey got ready for the wedding at The Press Hotel in downtown Portland, Maine with her mother and two sisters. After that, we shuttled down to the Maine Narrow Gauge Railroad Co. & Museum for Lindsey and Chris’ first look. The couple shared an emotional moment together seeing each other for the first time in their wedding attire. While waiting for the train, we took the opportunity to utilize the grounds of the museum for portraits of the two of them. The old antique trains were perfect for their railroad train themed wedding. We also took photos on the docks overlooking Portland Harbor in Casco Bay, which was a lovely view. The train arrived, picking up guests at Portland Ocean Gateway on the way to the ceremony. We rode the train all along the Eastern Promenade Trail until we reached the ceremony location at Fish Point. After the ceremony, we took portraits at Fish Point and the train took us back into town where we walked to Rí Rá Irish Pub & Restaurant for Lindsey and Chris’ wedding reception. Once the family and couple were announced in, Lindsey’s dad started off the toasts and speeches, followed by her sisters and Chris’ brother. At last, the dance floor opened up and everyone enjoyed the rest of the reception. Later in the evening, a hot dog station was added to the dessert table area. They even fed each other a hot dog, which was quite entertaining and had everyone laughing and cheering! All in all, it was a wonderful wedding and I’m so happy to have captured these images that will retell the day again and again. How did you envision your wedding day — Did you have a color palate, style or vision? We really wanted a simple wedding. We started with the idea of just a nice dinner with our families and closest friends, and then it evolved a little bit but still revolved around being intimate, sweet, and most importantly FUN! We weren't big on the over-the-top wedding. We are basically the last of our friends to be married and we just wanted a fun and simple event and really didn't stress much about colors or style, just picked things we liked. There are too many to pick! Maybe it was when it DIDN'T rain! Otherwise, our first dance was super special, but I think we and all of our guests will agree the speeches were incredible. My dad, 2 sisters, and the Groom's brother all gave heartfelt, funny, endearing, and memorable speeches that had all of our guests in tears, laughter, and smiles from ear to ear. Another favorite was that my Dad and the Groom spent a day building a homemade Birch arbor to be married under at the ceremony. Just do what you WANT! Don't get too caught up in the crazy wedding planning thing - the most important thing to us was good food for our guests, simple decor, and a laid back style that reflected us. We had an awesomely simple ceremony and venue, a fun wedding train (Maine Narrow Gauge Railroad - it was awesome! ), and a great party. What more do you need?